Early on in our artistic practice we became aware of a startling occurrence. People reacted differently to our work upon viewing it a second time. For instance, when I (Ruth) applied for the first art school in my hometown, Graz, Austria, I showed a portfolio of ink drawings that received rather mild interest. After I started my studies, I showed the same drawings a few months later to my teacher again, and this time he seemed amazed by the works. This occurrence has repeated again and again in both our individual and our collective artistic biography. Before delving further into our personal curatorial efforts, however, we would first like to frame our screening methodology and philosophy with a brief history of our model exhibition methodology. In 1918, an annoyed Arnold Schönberg founded the Society for Private Musical Performances to extract contemporary music from a debate that was polemic and fruitless. With his students and friends, he constructed rules for a discussion that would suffice for the needs of art and would not foster mundane conceitedness. 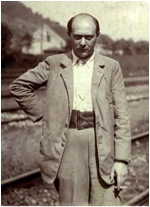 Composer Alban Berg, Schönberg’s former student and close friend, noted that the goal of this format was to provide artists and art lovers with a real and profound knowledge of modern music. A piece was played and discussed and then played a second time or even multiple times. The exact program was kept secret, so that people would come for the music and not for the Big Names. Critics and journalists had no right to attend the performances. Applause and jeers were forbidden. The discussion had to be strictly on topic. 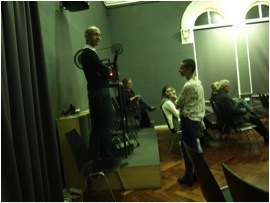 We wanted to hold a screening in the way that music was performed in Arnold Schönberg’s Society for Private Musical Performances (Verein für musikalische Privataufführung). In 2011, we invited friends and colleagues to show them our two latest films Ink, Rain, Swans in a Shanghai Park and Contemplations. 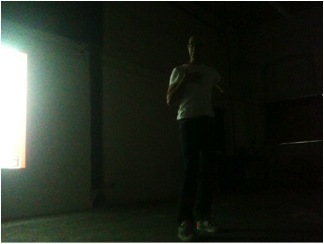 We eagerly used this opportunity to try out his methods in a screening of our own films. 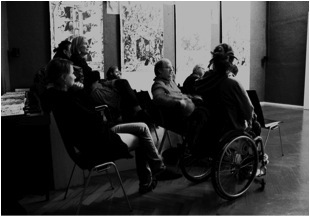 Encouraged by the first two screenings held for friends, we launched the artist run screening and discussion series HASENHERZ or the Pleasures of the Moving Word and Image at Kunsthalle Vienna and at Kulturzentrum bei den Minoriten, Graz in 2012. Our first attempt on appropriating Schönberg with our own films only used the principle of repetition. Although it is perhaps not so warmly embraced at in its first moments, we see repetition as having the potential to trigger intensity and elation in the audience. Quite a few fellow curators we had discussed the idea with were not so convinced of the critical capacity of asking an audience to engage with already formally challenging twice. However, in the first screening of HASENHERZ, each attendee stayed through both screenings and remained engaged in the following discussion. Each iteration of HASENHERZ has had a similarly critical and dedicated audience. In 2012, we did not announce the artists’ or films’ names at Kunsthalle Wien and at Kulturzentrum bei den Minoriten, but the program was published afterwards on both our webpage and the institution’s homepage. In 2013, we started giving the names of the artists in advance, but not the titles of the films. This year, we will announce the names of the artists involved, but without related dates. Being first and foremost artists, we try to connect our practice of programming as closely as possible with our own artistic interests. Recurring themes, e.g. time-space relation in moving image, the combination of sound and image, and diversity in artistic practice shape our leitmotif. At 12 screenings in 2012 and 8 screenings in 2013, we have a few fixed points, but try to alter or intensify a theme, if we feel the need for it. As a result of this performative programming, we remain very attentive to our audience in order to shape and widen their picture of moving image art in conversation with them, rather than offering works in a “top-down” manner. During a residency in Switzerland in 2008, we encountered other exemplary inspirational and ambitious exhibition models. 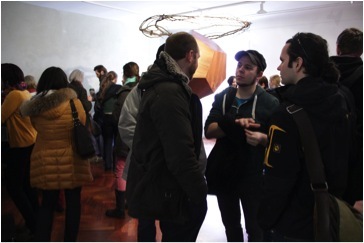 In particular, Kunsthaus Aarau had a program of guided tours through their exhibitions held by people from other disciplines, which was visited by a very heterogeneous audience. Their exhibitions were especially characterized by lively and open-minded discussion between artists, art historians, the curator, engineers, theologians, and pupils of the public school. This encouragement of level but critical discourse was instrumental in the development of our exhibition and educational philosophy. Breakfast after HASENHERZ 2013, photo © Kulturzentrum bei den Minoriten. One of our primary goals is to offer the audience a space and experience in which learning the language of moving image art can take place, and where “failure” to do so lacks social or institutional consequence. We believe that it is necessary to learn how to get to the information, and also that it is necessary to confidently approach this information. By repeating the film, there is less an obligation or pressure to engage the film in its entirety in realtime. Rather, the viewer can relax and plunge in the experience, knowing the film will be screened a second time, knowing that they can follow the discussion and pose any questions in between the screenings. This can be a quite freeing moment, as in Austria, most discussions on experimental film and video art privilege academic jargon and discourse. We do not mean to here suggest that this is a bad thing for the purposes of evoking the stakes of a film in all of its aspects, but it can certainly be daunting, if not off-putting, to ask a question or offer an opinion without having a quote from Walter Benjamin at the ready. In Vienna, our audience consisted mostly of artists, filmmakers, curators, art historians, students, and others also close to the arts. In Graz, our audience is more heterogeneous, and there are fewer opportunities to see moving image art on a regular basis. Therefore, our work in Graz is arguably more grassroots in nature. No matter the regional differences in our audiences, both locations yielded a group of regulars quite quickly. 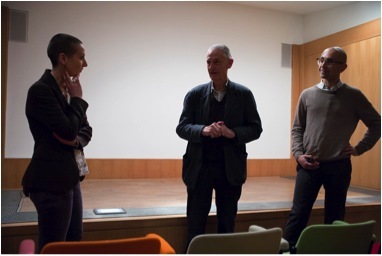 HASENHERZ at Whitechapel Gallery 2013, Ruth Anderwald, Werner von Mutzenbecher, Leonhard Grond photo © photo Felix Friedmann. As we continue to host new iterations of HASENHERZ, our work grows more and more into a performative practice. The more we experiment, the more freely ideas flow. As previously stated, we really like to connect to our audience and to create an ongoing experience for them by considering their interest and knowledge in relation to the different possibilities of contemporary visual thought. We aim to continue to explore our screening possibilities, and have attempted new screening formats already. 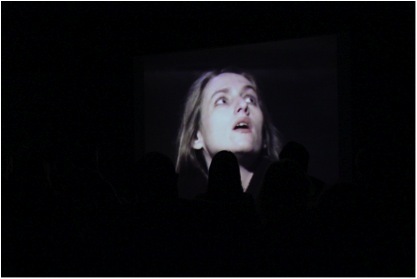 This November, we had tested a singular HASENHERZ screening (no concomitant second screening) at the Whitechapel Gallery in London. Though it was an exciting experience with that audience, as well as Swiss artist Werner von Mutzenbecher, we will say that we prefer the serial type of screenings that fosters an intense exchange between the artist, the audience and ourselves. However, we have already combined our HASENHERZ with other fields of the arts, such as poetry or music. In one iteration, we included a serving of food in between screenings (Japanese sweets that had a connection to Maki Satake’s video work). This autumn, we plan a co-operation with Klangforum Wien, a leading orchestra for contemporary music. On this occasion, the films will be screened in a concert hall. Instead of the usual discussion of the films in between, a piece of contemporary music will be proposed by the orchestra. Finally, we see HASENHERZ as a possibility to encourage a winding down: a strategy against today’s alarmism that keeps us simultaneously in perpetual overexcitement and inanition. Art, and as we aim to demonstrate, film, is the ideal medium for a second viewing, a slowing down to see that art and life are worth your increased attention. Rosalind Nashashibi, HASENHERZ November 2012. »The screening model of showing the film twice while hearing the artist talk about the work in between both screenings leaves room for the viewers’ imagination and own in- terpretation of the work. At the same time it gives them insight into the work and allows the artist the chance to offer as many or little clues as he/she sees is necessary about it.« Basim Magdy, HASENHERZ October 2013. Milos Tomic, Bärbel Neubauer, Werner von Mutzenbecher, Basim Magdy, Helga Fanderl, Wendy Vainity (conversation with video artist Fiona Rukschcio), Rose Lowder, Stephen Dwoskin (conversation with writer Franz Schuh), Maki Satake, Hans Richter (conversation with composer Benjamin Schweitzer), Rosalind Nashashibi, The Vasulkas, Hannes Schüpbach, Bruce Baillie, Vivian Ostrovsky, Evelyn Schlag (poet), Dominique Willoughby.